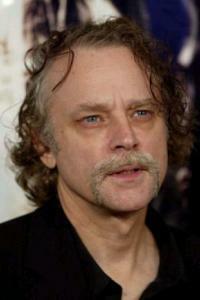 Brad Dourif was born on March 18, 1950 and his parents named him Bradford Claude "Brad" Dourif. He is a 5' 9" (1.75 m) American actor, comedian and voice artist. He became famous when he portrayed Billy Bibbit in One Flew Over the Cuckoo's Nest. His fame escalated, and he soon became famous for portraying Charles Lee Ray/Chucky with his voice over and live action in the Child's Play franchise. He is known best for his deep raspy voice, voice of the evil doll Chucky in the Child's Play Franchise, his blue eyes and for playing demented, sociopaths, lost souls, deranged or disturbed character in movies. Brad Dourif was born in Huntington, West Virginia to parents Jean Henri Dourif and Joan Mavis Felton. His father owned a dye factory that he operated, and he was an art collector, and his mother was an actress. His paternal grandfather was a co-founder of the Standard Ultramarine and Color Company in Huntington. Joan married William C. Campbell after Jean died in 1953 when Brad was only three years old. William was a champion golfer that helped Joan take care of her four daughters and two sons. His inspiration for acting came from his mother being an actress in theater show "Give me Shelter." Brad attended Aiken Preparatory School in Aiken, South Carolina from 1963 to 1965 to study art and acting. He attended Fountain Valley School in Colorado Springs, Colorado and graduated in 1968. He then attended Marshall University but soon dropped out at 19 years old and moved to New York City. Brad started acting from a young age. He first acted in schools and then joined the Huntington Community Players and performed in community theaters. He worked with Lanford Wilson and Marshall Mason at the Circle Repertory Company while studying with Sanford Meisner in New York at age 19. He appeared in Woodstock, New York, The Doctor in Spite of Himself and a few other off-Broadway plays during the early 1970s. Brad’s first movie appearances were in W.W. and the Dixie Dancekings (1975) and low budget movie, Split, that was never released. Director Miloš Forman cast Brad in One Flew Over the Cuckoo's Nest (1975) after seeing his performance in When You Comin' Back, Red Ryder? He won a Golden Globe Award for Best Actor Debut and a Supporting Actor award from the British Academy Award for his role in One Flew Over the Cuckoo's Nest (1975). He also had an Oscar nomination for Best Supporting Actor. He moved to Hollywood in 1988 after finish teaching acting and directing classes at the Columbia University in New York. He was married to Jonina Bernice whom he divorced, and they had one child together. He was also married to Janet Stephanie and divorced on June 20, 1980 - they also had one child together. His two daughters names are Fiona Dourif and Kristina Dourif Tanoue. He has one grandchild Caden Kalani Kahalewai Dourif-Tanoue that was born in 2001. Brad did the voice of Chucky in the Child's Play franchise and played Gríma Wormtongue in the Lord of the Rings trilogy. Brad's daughter Fiona starred with him in the 6th installment of the Child's Play franchise. He made five trips to New Zealand for the filming of Lord of the Rings trilogy and had to shave off his entire eyebrow each time. Brad and Samuel L. Jackson has starred in four movies together: Ragtime (1981), The Exorcist III (1990), Jungle Fever (1991) and Amos & Andrew (1993). It appeared as though Brad was made to play deranged, demented and disturbed characters. Video games - Brad loves video games.